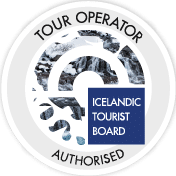 The guided Golden Circle tour takes you to three natural and historical attractions, Gullfoss (The Golden Waterfall), the hot spring area, Geysir, and Thingvellir National Park. Your guide will pick you up at your hotel in the morning. You’ll drive to the Geyser area where you will visit Strokkur, a geyser that erupts on average every 4 minutes. Nearby is the magnificent waterfall Gullfoss, „Golden Waterfall“. After a visit to Gullfoss and Faxi waterfall, you will make a stop at Friðheimar and have lunch in a greenhouse. Then you’ll visit another beautiful waterfall, rarely visited. We drive to Thingvellir National Park, which is famous for it´s historic- and geological reasons. This is where the first democracy in the world was established, in AD 930. Öxarárfoss is a waterfall at Thingvellir. Pick up at your hotel around 8.00 AM, or meet us at Harpa Opera House at 8.20 AM. You probably did not know that the english name “geyser”, derives from the one and only in the Haukadalur area. The geyser Geysir itself erupts boiling water up to 70 meters, but is almost inactive. Strokkur, only few meters apart from Geyser, erupts on average every 4 minutes. Faxi is a nearby waterfall and we stop there. We drive for about 20 minutes to Friðheimar, where we will have lunch. At Friðheimar, tomatoes are cultivated in a greenhouse and a restaurant is right there in the tomato field in the greenhouse. The main ingredients in their menu is of course, tomatoes grown there. If we are lucky we might see their horse riding show. After a good lunch at Friðheimar we go back to Reykjavík. Thingvellir is characterized by tectonic rift valley and marks the rifting of the Eurasian and North American plates from each other. In 930 the Icelandic Parliament, the first democracy in the world, was established at Thingvellir. Thingvellir became a World Heritage Site in 2004. We walk to Öxarárfoss waterfall. You’ll drive from Friðheimar back to Reykjavík.